At least 30 people have been killed in an air strike on a market near the Yemeni capital, Sanaa, witnesses say. Residents said at least 30 people were injured, most of them civilians, the Reuters news agency reported. It is not clear who carried out the strike, but Houthi rebels have accused the Saudi-led coalition. The Saudi offensive is aimed at restoring the government and driving back rebels loyal to ex-president Ali Abdullah Saleh. Some 6,000 people have been killed since the start of the campaign last March, about half of them civilians, according to the UN. The strike hit the Nehm region north-east of Sanaa, where coalition-backed loyalists have been advancing as they try to reach rebel-controlled Sanaa, AFP news agency reported. An unidentified security source told the rebel-controlled Saba news agency that 60 people were killed and injured in the attack. The report included pictures of children being treated, allegedly as a result of injuries sustained in the strike. 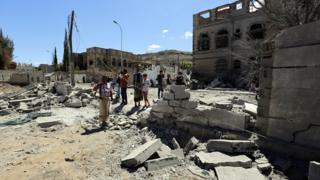 The agency also reported that other areas of Sanaa were hit by coalition air strikes on Saturday, but the information has not been independently verified. The coalition has not commented. The Saudi-led offensive supports the internationally-recognised government of President Abedrabbo Mansour Hadi, who has been based in the southern city of Aden since July. Saudi Arabia says the Houthis are supported militarily by its regional rival Iran - something Iran denies. In a leaked report last month, a UN panel of experts accused the Saudi-led coalition of targeting civilians with air strikes in a "widespread and systematic" manner. The panel said civilians were also being deliberately starved as a war tactic. Human rights groups have also said that the already dire humanitarian situation in Yemen has deteriorated severely, with more than 21 million people, or four-fifths of the population, now requiring aid. Why is there fighting in Yemen? The war the world forgot?